Gilder began studying art in New York with August Will and after arriving in Omaha in 1887 he became a student of J. Laurie Wallace. Gilder’s early career was as a journeyman printer for several Omaha newspapers but after his retirement in 1919 he devoted his full attention to his avocations of painting and archaeology. In 1906 he discovered “Loess Man”, considered at the time to be the earliest remains of the inhabitants of America. He later served as chief archaeologist of the University of Nebraska Museum for 12 years. 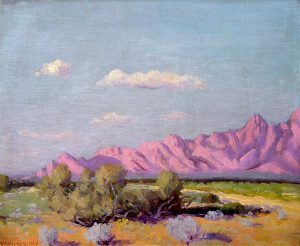 He made many trips to the Southwest both for archaeological work and for inspiration for his paintings. However, his beloved Nebraska was always his primary source of subject matter. In 1916, Gilder built a studio-home called “Wake Robin” in a wooded spot in Bellevue. He used this as a primary residence until his death and the house appears in many of Gilder’s paintings as well as those of his friend, Augustus Dunbier.